Pure beeswax is the only ingredient found in these hard to find tall solid 100% USA beeswax pillars. 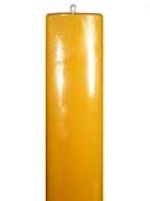 Our 24" x 3" beeswax pillar will look magnificent on your hearth. Please burn on fireproof container and don't leave a burning candle unattended! Please Note: We will ship these large pillars UPS Ground if it is a more economical way to ship than USPS Priority.